Mmmmmm, that looks good Janice and would work well with a lot of cakes. Would be great with Christmas cake. If I see one on sale I am going to make this. Yum! Thanks for taking part! What a great idea! 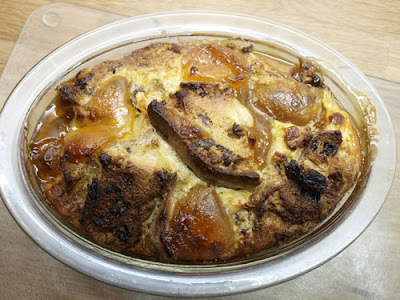 I have a bread pudding idea brewing too! Frugal food friday is currently monthly until I get some gueest hosts lined up - let me know if you are interested. I love stollen so much there are never any leftovers in my flat! But if there were I'd love this. Oh my word - that looks positively sinful but such a treat at the same time! That is SUCH a great way of using up all those bits and pieces that are left over from Christmas! It looks all puffed up and light, my kind of pudding Janice! great idea:) mind you, I really love stollen, the idea of having any leftovers!!!! looks great! I wish I had stollen left over!!!! mine just goes!!! Great idea - I have done this with leftover croissants and even with banana bread when it's passed it's best (with raspberry jam spread on it!). We have leftover cheese but there are no complaints from me about it!